An Exciting New Blackjack Game Players will Love! 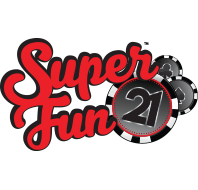 Super Fun 21™ plays similar to regular blackjack, but with a few fun twists to keep your players coming back for more! To begin, all player's cards are dealt face-up to reveal a variety of options available to players and new ways to win! This game also features a Super Fun bonus bet area, where players can place an optional $1 wager and can receive a 300-to-1 bonus payoff when they have a blackjack consisting of both diamonds.